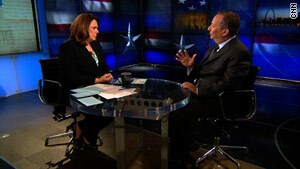 Lawrence Summers tells CNN's Candy Crowley that the economic trend has turned. Washington (CNN) -- The slow but steady U.S. economic recovery appears set to continue, with underlying indicators signaling a growing strength, some of the nation's senior economists said Sunday. "The trend has turned," said Lawrence Summers, director of the White House National Economic Council, on CNN's "State of the Union" program. "But to get back to the surface, we've got a long way to go." Former Federal Reserve Chairman Alan Greenspan told ABC's "This Week" that the recovery so far has led to conditions for compounding growth. In particular, Greenspan cited an increasing demand for inventory that spurs production as a signal of a possible significant buildup in growth. "I suspect it's month by month," Greenspan said of continued economic growth, adding that "a statistical aberration is possible." He said he doubted there would be another drop in growth to create what economists call "double-dip recession" after the downturn of 2008-09, saying the odds were "very much against that now." On NBC's "Meet the Press," the chair of Obama's Council of Economic Advisers, Cristina Romer, said the recovery would have to be systemic rather than consumer-driven because, in the wake of the recession, "we're not going to be see people maxing out their credit cards again." Romer predicted economic growth for the year of 3 percent, which she said would be enough to keep creating jobs but not enough to significantly reduce the unemployment rate. All three spoke two days after the government announced 162,000 news jobs created in March but the unemployment rate remaining at 9.7 percent. Summers refused to be pinned down on when the unemployment rate might decline, noting that the increase in jobs does not automatically reduce overall unemployment. As jobs are created, Summers told the ABC program, more people re-enter the labor force to look for work, so unemployment figures stay stagnant or can even go up. On "State of the Union," Summers cited steps the Obama administration is taking to reduce the unemployment rate, including continued implementation of the $800 billion economic stimulus package from February 2009; new tax credits intended to encourage businesses to increase hiring; incentives for small businesses to expand; and initiatives to create a "new energy economy" that focuses on energy efficiency and renewable sources of energy. Republicans complained that the administration's policies were creating government jobs for political expediency, rather than stimulating private sector economic growth. "At this time of high unemployment, when we need to focus on jobs, we should not be expanding government spending, government commitments, and government promises that crowd out the small businessman and businesswoman," said Rep. Kevin McCarthy, R-California, in the GOP weekly radio address.